The wealth management sector has traditionally thrived on being a high touch industry and the stereotypical image of the private banker as a discrete, greying individual with gravitas, in wood panelled rooms, probably still holds true in the minds of the population at large. But what do High Net Worth Individuals (HNWI) in the UK today think about their banking and wealth arrangements? What is their experience of their wealth providers? 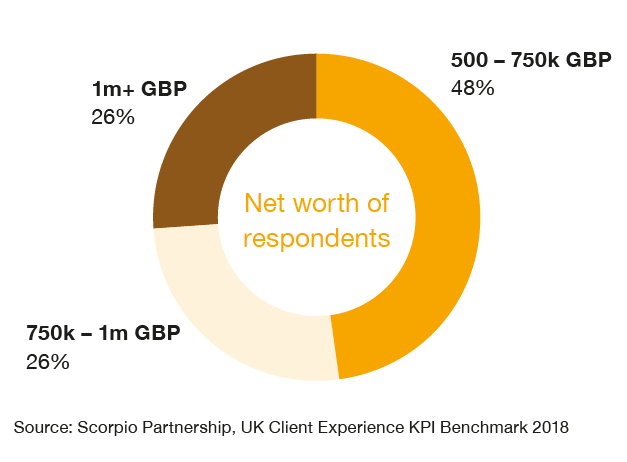 Scorpio Partnership has released the results of the first UK Client Experience Benchmark. This is the first and largest survey of its kind – surveying 915 high net worth individuals in 2018, and serving as a barometer of the HNWI client journey. Respondents had net investable assets between £500,000 and £5 million and were clients of 25 leading private banks and Private Client Investment Manager in the UK with an advisory or discretionary mandate. The survey covers the full breadth of the client experience from account opening, through day-to-day experience, to general attitudes to the brand. HNWIs’ overall satisfaction with their private bank or wealth manager is high. The UK wealth industry’s average share of wallet is also significant at an average of 61%. Typically, this figure is regarded as a plateau, making it less likely that firms can grow much further by acquiring even greater wallet share from existing clients. This points the industry towards growth through leveraging its strong performance for Net Promoter Scores (NPS) to drive asset growth through gaining new clients. 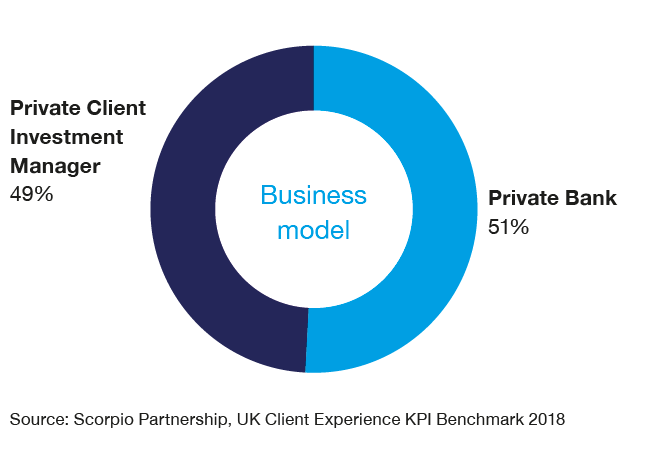 58% of respondents also believe their relationship manager is client-focused, demonstrating there is still some room for firms to improve in the area of delivering and promoting a client centric service. Although HNWIs are broadly positive in their feedback, as we delve into the customer journey, there are certain touch points which offer actionable insights for the industry. A key driver of value to the wealth management client relationship is the review meeting. HNWIs view this as an important step in the client journey. Respondents who meet their adviser on average twice a year, rate their firm much more highly — demonstrating the importance of these face-to-face meetings. In a similar vein, the value of clear communication and managing expectations comes to the fore. Firms polled weaker results in situations where clients felt that the requirements for onboarding or account opening were not clearly conveyed, leading to disappointment. There was also general concern across those surveyed around the onboarding process, rating it the lowest of all the stages of the client journey. One of the most striking conclusions from the research is the difference of opinion between clients of different generations. For example, the over 55 year olds segment reported much lower overall satisfaction scores and is most frustrated by account opening and with communication issues. This group also reported much lower overall satisfaction scores. Brand value too was also markedly lower for this group, at only 68% compared to 88% for under 35s. Interestingly, the over 55s segment also reported less personal engagement with their relationship manager, again demonstrating the importance of relationship management, and suggests this is an area to be remedied. This gives rise to some interesting questions. Do the under 35s report a more positive experience because their affairs are less complex and — as the timeframe of their wealth relationship is shorter — they have had fewer negative experiences? Or is it that there is more focus on millennials in the wider market conversation, adding to their overall brand experience? This younger demographic, while most satisfied across the board, highlights a desire for products and services to reflect their risk profile and investment objectives more closely. It will come as no surprise that having a compelling digital experience is an essential part of client experience. Many respondents feel that the wealth management industry can learn much from ecommerce retailers such as Amazon or large retail banks like HSBC and Barclays. These brands are creating a seamless multi-channel experience for clients — evolving ‘nice to have’ digital features into integral parts of daily life. Rather than create something ‘external’, like navigating to a portal, the wealth industry needs to focus on a digital experience that integrates with similar ease into their clients’ lives. This will foster a truly customised and omni-channel experience. 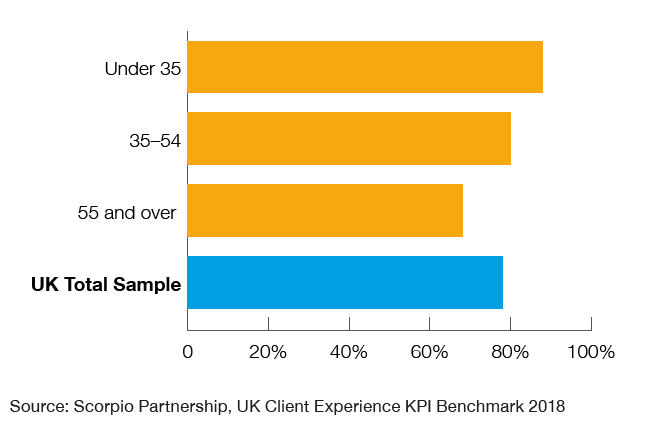 Findings from the first UK CX benchmark for the wealth sector demonstrate the importance of each touch point to the client journey — highlighting where wealth managers can bring further value add to their relationships with clients. The results also indicate that although innovation in the digital experience is essential, the wider picture including clear communications and processes, and face-to-face meetings coupled with responsive day-to-day management needs continual attention. These touch points are appreciated by clients, so firms should continue to focus on these as part of their wider strategy. Key to improving client experience will be the wealth sector’s ability to capitalise on uniting the traditional association for exclusivity with greater levels of personalisation and customisation enabled by technology.